As a small family hatchback, the Civic is in a very competitive market. There's a huge choice of cars for buyers to consider ranging from value makes like the Kia Ceed up to premium models such as the BMW 1-Series. Even when you've narrowed your choice down to a few models, comparing like against like can be very baffling. 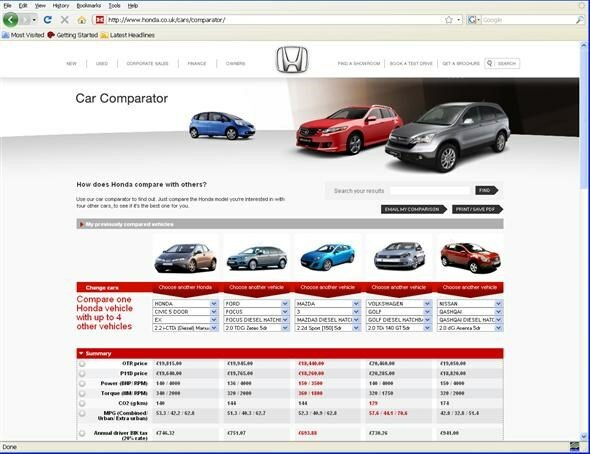 But Honda has come up with an incredibly useful tool in the shape of its new online car comparison tool. Certain other manufacturers do offer a similar tool, but none are as user-friendly nor as comprehensive as the Honda one. It allows you to choose up to four cars to compare to any Honda model. You can specify specific engine and trim levels too, allowing you to compare like for like. It's incredibly easy to use and very quick too - unlike some comparison tools. It lists a huge amount of information on every model too - from performance and economy to equipment levels and vehicle dimensions. 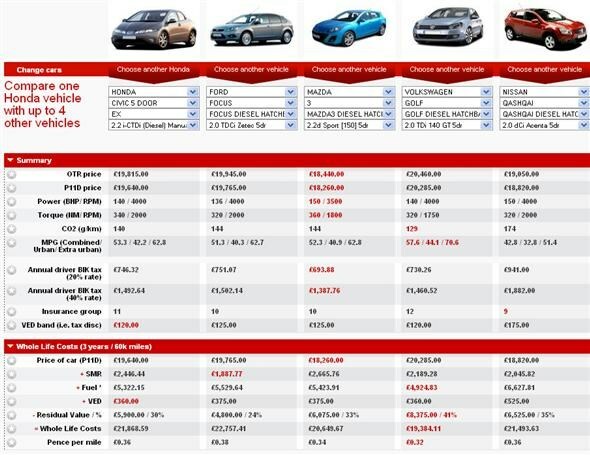 In every case, the best figure is highlighted in red, so there's no favouritism to Honda! A further useful inclusion is whole life costs, allowing users to see how much each car will cost over three years or 60,000 miles. This takes into account service, maintence and repair costs as well as the cost of fuel, tax and residual values. When you've finished you can save the information as pdf - useful when visiting a dealer and negotiating on price and optional extras. I compared our Civic to key alternatives such as the Volkswagen Golf, Ford Focus, Mazda3 and Nissan Qashqai. It was the Mazda3 (2.2d Sport 150) which came out as the cheapest - and the most powerful too. But the Civic is still the quickest from 0-62mph of all five and was one of the best for equipment levels too. It confirmed why we at Parker's rate the Civic so highly, but also showed that there are plenty of excellent small hatchbacks available to buyers.